Phlan is a small city of about 4,000 located in the northern section of the Moonsea region at the mouth of the Stojanow River. 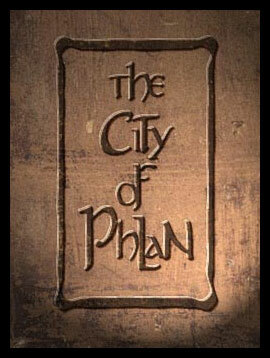 Founded over 1,000 years ago, a series of destruction and rebuilding has led to the city being walled off into a destroyed, ruined Old Phlan and a rebuilt, shining Civilized Phlan. Phlan is noteworthy not only for its stubbornness but also as the location of the fabled (and hidden) Pool of Radiance, source of power of the otherworldly Tyranthraxus. The town is currently growing even more popular as a stop for caravans and ships due to its continued rebuilding, resilience in the face of repeated attempts to destroy it, and the return of its ancient ruling dynasty. Local points of interest include: the slowly rebuilt Valjevo Castle, one of the largest castles in Faerun; the Valhingen Graveyard, north of the city, rumored to contain powerful undead; and the only significant point of worship for Tyr, God of Justice in the Moonsea Region, The Waiting.